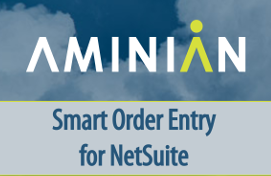 Aminian’s Smart Order Entry SuiteApp provides the ability to create sales orders based on a customer’s previous purchase history. Its goal is to greatly reduce the time associated with generating sales orders for existing customers by allowing Sales Reps to create new orders based on a customer’s purchases over a 30, 60, or 90-day period. Sales Reps now have the ability to easily create sales orders based on any customer’s unique purchase history. This provides increased efficiency, prevents miscommunication with customers, and protects against data entry errors in your NetSuite account. Ideal for manufacturing and distribution organizations, our Smart Order Entry SuiteApp increases productivity by integrating customers’ purchase history and current inventory levels into a single, end-to-end application that simplifies the customer re-order processes. Sales Reps now have the ability to easily create sales orders based on any customer’s unique purchase history. This provides increased efficiency, prevents miscommunication with customers, and protects against data entry errors in your NetSuite account. With just the click of a button, our Smart Order Entry SuiteApp enables Sales Reps to instantly source items purchased over a 30, 60, or 90-day period for any customer. Additional items can be added to the sourced item list to promote cross-sell and up-sell throughout your Sales Department. Our Smart Order Entry SuiteApp also provides Sales Reps with visibility into available inventory levels when creating a new sales order. This saves time and increases productivity by alerting Sales Reps to any potential shipping delays or back-order situations without having to review a separate inventory report. Sales Orders created through the Aminian Smart Order Entry SuiteApp can be viewed under the “Transactions” tab of the Customer Record for subsequent tracking/reporting.